The Macy's Thanksgiving Parade is here and that means the entire country will be glued to their televisions to watch three things; giant balloons, broadway performers lip syncing and MARCHING BANDS! That's right! The Macy's Thanksgiving Day Parade is a great way to showcase our sport and brings both high school and college bands together. This year don't miss it all in 360 video LIVE on YouTube. You can watch it at this link https://youtu.be/eEVUjvSc8Wk during the parade. This year the lineup for bands includes the mainstays like the NYPD Band and the Great American Marching Band which includes high school marchers from all across the country. The two college bands are West Virginia and West Point. It is great to see the military academies be represented, but the crown jewel of the parade is the Pride of West Virginia. This great college marching band is sure to dazzle fans during the parade and will represent our sport very well. 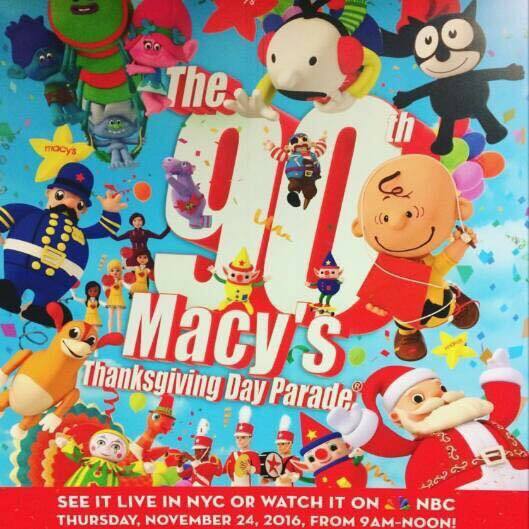 This will be the first time the band will march in the Macy's Parade. The band should arrive to the TV viewing area before 10am EST so make sure to be watching! They will play "Strike Up The Band" and then "Country Roads". Good luck to all the bands marching in the parade. We will be cheering for you all! Next year the Ohio University Marching 110 will march in the parade as well as Prairie View A&M University.